To solve customer communication issues that have been plaguing businesses of all shapes and sizes, we have been reinforcing companies with one of the most effective online marketing tools available today: Webinars by ClickMeeting. Webinars provide businesses with an engaging way to reach out to a group of people separated by location. As it is a scheduled event, audiences are guaranteed no interruptions or disruptive pop-ups, increasing the value to viewers. Create a stronger connection and interaction path so clients can put a face to your business, strengthening rapport allowing you to better serve your client base. Webinars elevate and distinguish your business from the others by shaping your image as experts, maintaining your global presence and showcasing your business as a recognized industry authority. While giving you a greater market reach, webinars have the highest sales conversion rate than other marketing methods on the internet surpassing sales letters, videos, email and even social media. Save time and thousands of dollars on conferences, seminars, renting out convention halls and travel expenses by conducting webinars right in your office and allowing your audience to watch from wherever they want. How did we choose ClickMeeting? We assessed business webinars solutions available at different price ranges with different functionalities. Our target was a software that will suit and accommodate every business group: multinational enterprises, one-person firms, clinics, large MLM groups, marketers, trainers, teachers and even freelancers that attract hundreds to their webinars. ClickMeeting ticked every box we had, performing optimally to bring the power of videoconferencing to organizations of any size. We took our time and checked. Using Dioma CMS administration panel, your website can now be integrated with ClickMeeting, which enables you to efficiently control and monitor webinars. This also allows you to manage payment options and generate direct access links. Who needs Dioma CMS & ClickMeeting? Doctors and medical specialists who provide online video consultations, webinars and presentations on health issues are now in demand as patients seek for opinions, diagnoses and information from the comfort and privacy of their own home. Connecting Dioma CMS and ClickMeeting gives both sides- doctors and patients- exactly what they want: Accessibility, Affordability and Quality. This enables doctors to connect and strengthen rapport with patients and spread health information in an easy way. Doctors are now able to prepare presentations in advance, upload patient files, elaborate via demonstrations and videos during online consultations, maximising patient experience. Studies have found that “students in online learning conditions performed better than those receiving face-to-face instruction.” Webinars have transformed and optimized E-learning, giving students and teachers the freedom to pick their where and when with minimum hassle. This low-cost online teaching platform provides schools, institutions, private academies, tuition centers and freelance teachers with the perfect solution to conduct online classes with all the features of a real-life classroom and more. Dioma and ClickMeeting delivers that space and versatility for effective learning to the education system, empowering both teachers and students with customizable classes and the convenience of its many interactive features such as the ability to live record for playback, share screens, chat and discuss with the interactive whiteboard, - be it for a one-on-one lesson or a session for hundreds. Sell and Train is the mantra of leading Sales teams so intense focus is poured on to generating sales and training the agents to equip them with valuable tools to achieve this goal. Since any network marketing or affiliate program can be promoted in a Webinar, the telephone is now being abandoned for a more interactive, flexible method. Used for product launches, demos, team training and customer communication, interactive webinars show off the features and advantages of your product or service, even to participants on the other side of the world. The polling feature enables evaluation of the effectiveness of your webinars and training programs. Through the power of webinars, sales teams of all sizes can build more personal relationships with their potential customers online, learning more about their needs so that you can develop ways to satisfy those needs profitably. 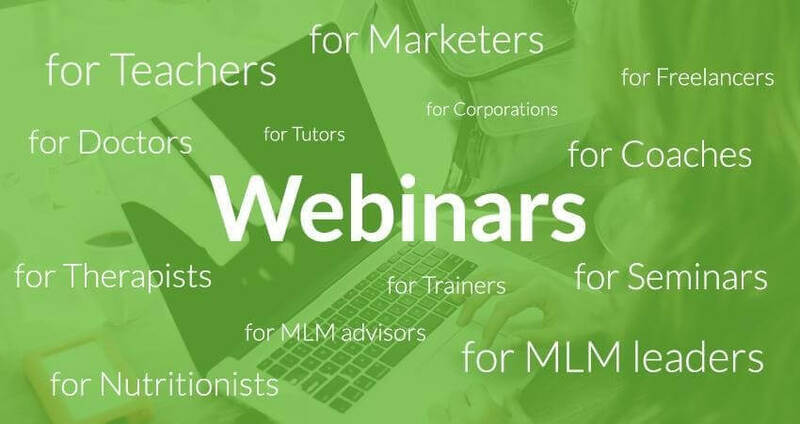 Using lead generation and network marketing webinars to increase sales and create marketing buzz, Dioma CMS and ClickMeeting will systemize your business with the ideal solution for MLMs to present unlimited business opportunities. Get a 15% discount and a 30-day Free Trial by using the link below. Join our group of readers who gets new articles reminders and additional content.